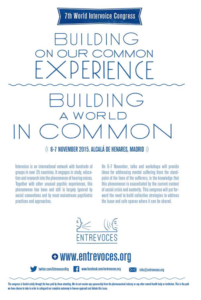 The 7th World Hearing Voices Congress was hosted by the Spanish Hearing Voices Network – Entrevoces. Alcalá de Henares, Madrid, Spain. Entrevoces (Spanish Hearing Voices Network) wants to thank all those who have made possible the 7th World Hearing Voices Congress. All without exception: participants, speakers, volunteers,… This has been a unique experience which has a value that now we can’t imagine . All nerves remain running high on emotions. Sharing of experiences and knowledges , meeting between peers and the certainty that you can watch and listen to alternative ways to the dominant vision, that widens the horizon. An horizon that has remained for too long closed. We are aware that there is still everything to be made, but we also have the confidence in the idea that the road passes through making connections and built up community. We will walk slow, but we will go far. P.S. : We expect to have prepared and to have ready to share most of the talks and workshops’ recordings by next Spring (for free). We are still going to use social networks for some time. So, we will make an announcement about it. John Wetherell, Project Assistant from Mind in Camden’s Hearing Voices Team attended the conference and wrote a report of what he saw and heard. If you would like to find out more about what happened during the congress, you might like to read his reports. “Voces descalificadoras, contexto social y arte de la desobediencia” / “Denigrating voices, social context and the art of disobedience”. “Navigating the Space Between Brilliance and Madness: Stories and Lessons From the North American Mad Movement”. “Transitando el espacio entre la brillantez y la locura: historias y lecciones a partir del “Mad Movement” norteamericano”. Martín Téllez (España) y Sascha Altman (USA). Co-founder Icarus Project. “Austerity, corruption and mental health”. “Austeridad, corrupción y salud mental”. Will Hall. Madness Radio (USA). “Anatomy of an Epidemic: History, Science, and the Long-term Effects of Psychiatric Drugs”. “Anatomía de una epidemia: historia, ciencia y efectos a largo plazo de las drogas psiquiátricas”. “Voice hearing experience, embodiment and culture”. “Experiencia de escucha de voces, corporeización y cultura”. “Riding psych disorder trough history’s abyss: lost generation’s comeback. From the maze of psychological irrelevance to transgenerational justice”. “Llevando el trastorno mental a través del abismo de la historia: el regreso de la generación perdida. Desde el laberinto de la intrascedencia psicológica a la justicia transgeneracional”. “The extended therapy room”. “El espacio terapéutico ampliado”.